Many modern couples are embracing new tradition and writing their own wedding vows. Both men and women can suffer from writer’s block when they finally sit down and try to find the perfect words. Expressing yourself to your beloved can sometimes be difficult, especially when in front of countless guests. 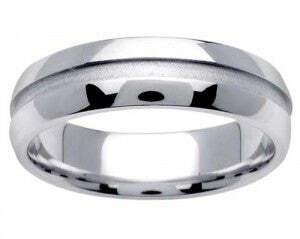 You will want to say the something meaningful when you slip his mens platinum wedding band on. Firstly, it is important to make sure that your officiant as well as the congregation allows personalized wedding vows. It is also a great idea to let them read your vows ahead of time so that they can approve them. The best thing to do is not to over think it. Share a sweet story about how the two of your met, or how your life has changed since you met your beloved. Before slipping on his ideal choice from platinum mens wedding bands, tell him that he has changed your life for the better. It is also sweet to share what you have learned about yourself since you met him and how the two of you are better together rather than apart. You will want to get your vows perfect before exchanging wedding rings. Speak from the heart and remember not to edit, edit, edit. Try to get your vows down to about a minute. Your wedding guests will thank you and if your wedding vows are short and sweet, you will have less of a chance of getting tongue-tied during the ceremony.